If the average believer could grasp hold of this truth – I died – half of our church programs would end immediately. We would stop trying to reform the old man because the old man is dead. He no longer lives! Instead of coming together to work on our flesh or improve our lives, we would be free to go tell our neighbors about the One who offers us His life. Instead of praying for revival, we would be revival. And if all of us did that, who knows what might happen. Sadly, though, since most Christians don’t know they have died, they waste their lives trying to nail themselves to crosses. Jesus died once for all but they die daily. Instead of reckoning themselves dead to sin, they are trying to throttle the sin in them and it’s a flesh trip. Whether you indulge the flesh or whip the flesh you are walking in the flesh. It profits nothing. If you wanted to keep Christians ineffective and fruitless, there are two lies you could preach: (1) Make them believe that they haven’t died with Christ, or (2) make them believe that everyone has died and been raised with Christ – believer and unbeliever alike. Fifty years ago, in the time of Watchman Nee, the first lie was prominent. But look at the discussions lighting up Facebook today and you will see plenty of evidence of the second: Humanity died and was raised with Christ. Not everyone knows it, but humanity is now in union with Christ. This is a faith-killing message that does little to draw the unbeliever into a relationship with the Author of Life. It extinguishes fires that God has lit in the souls of the restless by preaching false peace and it mocks repentance as a dirty work. This seductive message is turning young firebrands and dear friends into candy-floss sellers and I hate that. Some interpret Paul’s words – all died – as meaning the entire Adamic race died on the cross in Christ. The problem with this interpretation, is that it is at odds with scripture. Paul says elsewhere that those who have died are freed from sin (Rom 6:7), yet the world remains a prisoner of sin (Gal 3:22). If those in the world aren’t free from sin, they haven’t died with Christ and Paul never says they have. Instead he says they are perishing (2 Cor 2:15). Jesus tasted death for everyone. He died so that all of us might be set free from sin and death and raised to new life. The benefits of Christ’s representative death are freely available to all but not everyone experiences those benefits. What are the benefits? When you put your faith in Christ you were baptized into Him and His death by the Holy Spirit. Water baptism, which is a re-enactment of that baptism, is best understood a burial service. When we go under we’re not drowning the old man – he already died with Christ – we are expressing our faith in the finished work of the cross. We are saying, “I trust Jesus. He died for me. His death is my death too.” These are not the sorts of things you will hear an unbeliever say. And that’s the one limitation of a representative death: it only applies to those who wish to be represented. I lived in Asia for 15 years. In many Asian countries, if you give your life to Jesus and start attending church, it’s no big deal. Your superstitious, idol-worshipping parents probably won’t have a problem with it. But the moment you start making plans to get water baptized, watch out! Now you’re crossing a line. In the East, faith without deeds is considered dead. So by all means preach universal salvation and write on Facebook that all died and are now in union with Christ. There’s plenty of room for passive ideology in the Buddhist/Taoist pantheon. But the moment you start to act on your faith, say, by getting water baptized, you will run hard into opposition. Many of the Chinese believers that I baptized went into the water against their family’s wishes. Do you see the point? As far as the idol-worshippers are concerned, something that happened 2000 years ago is of no consequence unless you identify with it today. They seem to understand better than we do that grace unmixed with faith is worthless (Heb 4:2). If Jesus had not challenged people to repent and believe the gospel, He would not have been tortured and killed. If He had preached, “It’s all cool, God loves you, hang loose – wait for Paul, He’ll explain it better than I can,” then the Pharisees would not have opposed Him with such violence. But Jesus preached for a verdict. “Who do you say I am?” Jesus wanted people to trust Him because those who don’t are condemned (Joh 3:18). Unbelievers have not crossed over from death to life (Joh 5:24). In his letters Paul consistently compared two kinds of people: (1) those who have died and now live and (2) those who are perishing. We who have died and now live with Christ have a wonderful message for those who are perishing: Now is the time of God’s favor, today is the day of salvation – not yesterday, not 2000 years ago, but today. Want to see these good news messages to reach more? Support us on Patreon. This message is not only relevent to clarify the true meaning of baptism and what it means to trust in Jesus but it comes at a time when many are being confused by the deceiver. If Satan can’t stop something he hates, he gets onboard to pervert it like a pendulum that swings to one extreme or the other. While our Father wants us unified, the enemy wants us polarized. I will pass this message along. Very well said Paul. I agree completely. The common objection I hear people use with this topic is the the whole “taking up our cross daily”, but they misunderstand the context. It isn’t talking about the need for daily death or crucifying the flesh. It is a metaphor for the need of daily surrender and laying down our rights to ourselves in favor of God having His way in us. Paul, I first heard of the “grace” message through your blog… even though I had been living it for over a year. God absolutely roared into my life when I was in the act of denying Him! After too many years of living the “christian” lifestyle, I finally came to the point where I couldn’t continue the lie that I had been living. I told God I couldn’t lie anymore. If He didn’t like that… then too bad! I would rather be live an authentic (gay) life and go to hell than continue with a lie for eternity. So there was no “repentance” on my side… but rejection; no public act to show others that I was “converted”. So… how did He respond? The very next day I was overwhelmed by a sense of His love for me. It didn’t make any sense at all. I was floored. I was totally dumbfounded. How could this be? How did I respond? I simply accepted the fact that God had a crazy love for me even though I hadn’t a clue as to why. The bible seemed to contradict everything I was experiencing. My life (a gay life) is full to the brim and overflowing with God’s amazing grace. I’ll bet there’s no logic that allows that! I’ve learned that I don’t have to solve a logic-puzzle to explain God’s love. It’s not something to be explained, but something to simply accept. Having the “right” doctrine is not what a relationship with Jesus is about. Having the right heart (simply accepting Him and His crazy love for us) is! It is faith that springs out of the heart that releases God’s power to transform us. That’s because God’s love is not conditional on your performance. You can still be saved while pursuing a lifestyle that is not what God desires for you. God will still love you even if you continue to yield to the desires of the flesh. However, if your heart is truly in the right place, and if you continue to seek Him and want His best for your life, eventually you will desire to be more yielded to Him and that is the power of God transforming you because of your faith that springs from your heart. I do believe that you are on the right track. 🙂 I have experienced a very similar “transformation” in my own life. God is a gentleman and doesn’t force things on us, but He does have a “prescription” for healthy living that He will work out in us if we seek Him first. Tom, this is how I understand your experience: Formerly, you did not know and experience the love of God because you were relating to him on the assumption that His approval was based on you maintaining a “Christian” lifestyle. You were unable to receive His love because you felt you had to do Christian things to get it. When you stopped relating to him on the basis of your lifestyle, you encountered his love in a dramatic and wonderful way. This is the message we preach. God loves us for who we are and not for what we do. Your behavior, whether good or bad, does not figure in His love-equation (Rom 5:8). This is not the place for me to comment on your current lifestyle choice. You already know my views on that. I think Brandon says it well: When our hearts are for Jesus, He will transform us according to His agenda and desires. I am sure you are a better man than you used to be – give Him credit for that. That’s His love at work and He’s not done with you or any of us yet. last night was when I came to the point that I was using religion and works righteousness I gave up trying to please God while giving him the credit for my good so-called moral behavior. I have an addictive personality and over the last two years have flooded my mind with teachings teachings and more teachings with minut transformation. I’m much more relaxed now and would like to share with you the following Scripture that really hit home for me and would like to share with you the following Scripture that really hit home for me and gave me hope. Hi Paul, a little addition to support your comments: 1Cr 15:22 For as in Adam all die, even so in Christ shall all be made alive. We could take the view from this Scripture that because every person is born a sinner, since the cross, every person is now made alive in Christ. But we cannot build a teaching on one or even two Scriptures. It becomes obvious therefore that when we compare Scripture with Scripture (1 Cor 2:13), we know that whereas when we were born in sin, we didn’t get to choose – since the cross – we have to make a choice if we want to receive Christ and be made alive in Him. This is a really good question and one that I address in this post. Short version: no, babies, and mentally handicapped people do not go to hell when they die. Note what King David said when his own infant son died: “I will go to him, but he will not return to me” (2 Sam 12:23). David understood that his week old baby went to heaven. I share his view. I agree with Paul. There are several portions of Scripture that support it. I think a Scriptural case can be made for an age of accountability and even a mental aptitude accountability also. wow! crystal clear . . . . .
Jesus died for all. It doesn’t matter if you had commited everysexual sin or every demon was demonstrated in your life be it physical, mental, social, emotional, or financial. All means all. Hebrews 2:9 “But we see Jesus, who was made a little lower than the angels, now crowned with glory and honor because he suffered death for EVERYONE!!! We are freed from sin. We will also live with him forever and ever. We are dead to sin, but alive to God in Christ Jesus. All of us who were baptized into Christ Jesus were baptized into His death. Now is the time of God’s favor, today is the day of salvation not yesterday, not 2000 years ago, but today. 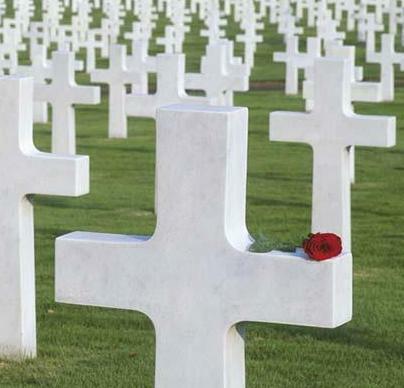 ALL died and ALL can live forever. It is difficult to tell if you are agreeing or disagreeing with the post. Yes Jesus died for all, and you are correct it does not matter what sins you committed or demonic influence you have experienced. Salvation is a gift, but a gift does not profit you anything if you do not open the gift. You have to “receive” the gift to gain the benefit of the gift. You receive it by faith. Without faith, it is impossible to please God. Abraham “believed” God, and it was credited to him as righteousness. Our righteousness comes by Christ, but we only profit from it if we receive what He has done for us. You have to “count yourself dead to sin, but alive to God in Christ Jesus”. 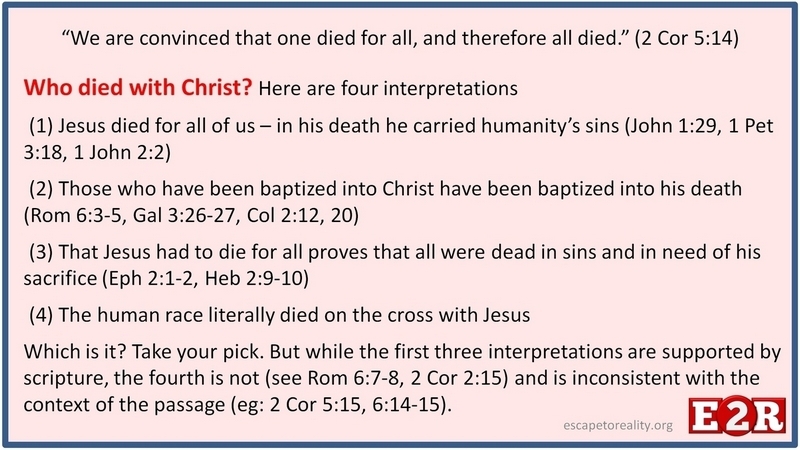 Hi Paul, I agree with you that not all “died with Christ.” But I’m afraid that includes many who are in the church and were baptized and consider themselves as “believers.” That includes me! Up until recently, I never realized that being buried with Him in baptism is not just dying to sin…but it is dying to the LAW of sin (Rom. 7:4,6; Col. 2:12-14). And to me, that’s where the real problem lies in the church. I was not taught this in regard to baptism when I was twice baptized, once at age 9, again in my early thirties. Most churches still teach law of some kind, either the ten commandments or manmade traditions, as the means of becoming righteous and ensuring salvation. And where I grew up, even baptism is taught more or less as a “law.” Probably the majority of the 38,000+ divisions of Christianity have come about because of disputes about law. It’s like Babylon again – confusion – because everyone speaks a different language about what is Truth and what is “essential” for salvation….and every group thinks they are right. With that many divisions, there’s no real unity in the Spirit. There is only one Spirit and one baptism and one Lord. Paul said he was determined to preach only Christ and Him crucified, but most of today’s preachers try to be so creative with their messages, that no one even hears this Truth anymore. He warned about the deception and false teachers who were already invading the early church. It is very subtle, because Satan disguises himself as a messenger of righteousness. In Revelation 18, there is a warning to come out of “Mystery Babylon” so that they (or we) would not share in her sins and plagues, because her sins were piled up to heaven, and God has remembered her sins. Obviously if He is remembering them, it’s because they are not under Grace (righteousness by faith), but under a mixture (mixed wine, v.6). So my question is, how can we be sure that we are not in fellowship with the pride of “Mystery Babylon” in our churches? Because I still see so many people suffering from the plagues/curses of sickness and disease in the churches. And how can we be certain that we are not still under law? It’s truly a matter of life and death. Thanks for helping me with this, because I am not going anywhere at the present time. I agree with Joseph Prince, we need a gospel revolution…..to finish what the reformation only started. I truly appreciate what you and others are trying to do, in bringing these Truths to light! Thanks for posting this. I’ve recently encountered some similar teaching to what you’re targeting. That all have died, been buried, and have been raised with Christ… born again new creations. I immediately felt a red light in my spirit. In fact, I had two consecutive dreams, and I felt like the Holy Spirit said clearly “avoid this type of teaching”. I love the grace message, it’s the good news… but receiving the benefits is a requirement. Thanks again! Let’s be intellectually honest in understanding who the “all’ is referring to in 2Cor15:14-15. Did Jesus die for all humanity? Did Jesus die for unbelievers and believers. Of course He did. I once believed as a Calvinist that Jesus died only for the elect, believers. And I used the same argument that “all” referred only to believers. Look at Rom5:18: “So then as through one transgression there resulted condemnation to “all” men, even so through one act of righteousness there resulted justification of life to “all” men.” God in Christ has indeed reconciled the whole world to Himself. Jesus has given life to all men. His work is finished. Does that mean everyone will die and go to heaven? Of course not. Universalism is an unbiblical doctrine. What Jesus has done is objectively real for everyone, but to experience this reality subjectively, personally, you must believe it. One must have faith. Receive it. Be reconciled to God. God’s love includes everyone. Faith in Jesus is the only conduit to receive the salvation that was given to us freely. We can think about a “for” which is not substitution. I can score a goal for my team, without any idea that I am the only one playing the game. I score the goal for the sake of others on my team, and not only for myself, but that does not mean they do nothing and I do everything. In II Corinthians 5:14-15, it is not the “for” which get us to the idea of substitution. What gets us to substitution is “therefore all died”. It is a mistake to reference the death of the all to some conversion experience that believers have. The death of all is not their repentance. Nor does “those who live” refer to faith or to conversion. The idea is not that Christ died one kind of death and as a result believers die another kind of death. The idea is not that Christ rose again from death and as a result believers now experience regeneration and the possibility of pleasing God. The idea is that the death Christ died to propitiate God’s wrath because of imputed sins. This death is counted to the elect. The elect do not die this kind of death. I do not know what you are all talking about. All are dead.we who know Christ are alive in him those who don’t know him are dead, but also alive in him, they have just not met him yet. So he is in everyone just not manifest. The power of life and death is in your tongue. Don,t go blaming God. He will have to pick up the mess we leave behind. And so, Is Water Baptism (full immersion) a requirement in order for one to be saved? Water baptism is not a requirement for salvation per se – we are saved by faith in Jesus – but a re-enactment of the true baptism of being placed into Christ. The only requirement for receiving God’s grace is you have to want it. And I know your arguments back to me. What about the thief on the cross? Yep, he is truly in Heaven! Jesus, who has all authority on Earth said so. Black and white. And later Jesus says, “it is finished.” His church and Christianity begins on the day of Pentecost. Nick, please respect E2R’s comment policy and keep comments short and relevant to the post being discussed. I trimmed this one but normally I don’t have time to play editor. Malcolm Smith says Most churches do not understand baptism. Watchman Nee makes it clear that there are two parts to Salvation, the first being the effect of Christ’s blood to deliver us from the “penalty” of sin and the second being the cross of Christ to deliver us from the “power” of sin, Rom 6. The thief on the cross didn’t need to, nor was able to get baptised because he was dying shortly, but for us who are not dying immediately after conversion, we need the power of the cross to deliver us from the power of sin. In other words The blood gets you to heaven but the cross enables you to live it on earth, and that explains why Christianity generally is lived so poorly. Its noteworthy to consider that in New Testament times they baptized immediately after conversion, and in many cases if one didn’t want to be baptized he was considered an unbeliever still. can you supply scripture for water baptism being part of salvation please sir? This is smart. Does this make sense. Objectively and ontologically, all died in Christ. He is the Human Reality now. But subjectively, we’re invited to willingly participate in that death and in that Reality, and share in the Divine Nature. Jim, that is the claim inclusionism makes – that all died, rose, and ascended with Christ, even those who don’t know it. As I explain above, and particularly in the boxes, this claim is fundamentally at odds with scripture. Inclusionism is a philosophy based on manmade precepts rather than God’s Word. I do believe only those who believe are righteousness of God. But isn’t the sin ( noun ) of the world taken away. I totally believe the only sin which separates man from God is unbelief in Christ as God and Saviour personally. But what do we announce to the unbeliever ? That’s probably mostly what I’m saying? Yes, the Lamb of God carried the sin of the world as John foretold. Sin is no longer the issue. What would I announce to an unbeliever? The good news. There is another interpretation I feel fits more. When Paul is saying this, he is simply (to me) using reverse logic. He is saying that since Christ’s death is for everyone, therefore everyone is standing in need of it. That is, Paul is using “foolishness” to say that because we agree Christ’s death was universal, therefore, all humanity universally stands in need of His work. This is born out more in the context when Paul writes, “Those who live”. Paul contrasts all humanity who has died with those who have received this gift, and are now living. This is what His love is compelling them to do–to tell the whole world of His saving Grace, and not what the inclusionists says, which is actually the opposite, that they already have it. If that were the case, they would not be compelled about anything. This, then, explains not regarding anyone from a worldly view… Those who are not saved, regard as dead, those who are, are alive. It may seem like “foolishness”, but follows directly on the heels of his previous argument in v12, where he is talking about being “out of his mind”. If Christ is the savior of the whole world through His death, then all have died and become prisoners of sin, and are dead in their transgressions, hence, God’s love compels us, who are alive, to go preach the everlasting Gospel that they might be saved. No universalism. No inclusion. What I think is that I have been hearing an awful lot of that teaching of “all humanity saved already” stuff lately. I also am so grateful for your website’s community of the “poster and postees”. Sharing my latest understanding would have to be about that line in the epistles that say “grace and peace from God our Father”. It’s like that word in a Psalm, selah. Now pause and calmly think about that – I think that is what selah means. Almost like how I feel after a yawn, the relaxing part. Oh the riches yet unseen. Paul, do you still hold to this teaching? something that always gets me and maybe you can shed light on it, if all, everyone came into death with adam without having to do anything, agree, believe it or have faith in it, then why do we now have to believe and confess christ to be saved, surely God does not need our agreement to bring us into reconciliation as he did not need our agreement to bring us into separation, also in acts 2 peter stands after the holy spirit is poured out and says today the prophecy has been fulfilled that all we receive the spirit of God. also paul says in galatians 1 that on the road to damascus God reveled the christ in him so he could preach the gospal, so with these few revelations we have did christ not die for all, restore all and is in all, this is a serious question thanks. Jesus undid Adam’s hurt and more besides. Before Adam, man was free to choose, and because of Jesus you’re free to choose now. God can’t force you into reconciliation because that’s not how reconciliation works. From his side, all is sweet, but you still have to choose. More here. What about 1 Timothy 4:10 Where Paul says that Christ is the Savior of all men especially those who believe? That verse seems to say that God will save all men. Ultimate reconciliation? If it were the only verse in the Bible, I suppose one could come to that conclusion. But since it isn’t, we can’t. 1 Tim 4:10 makes two clear statements: (1) Christ is the Savior of all; there is no other Savior. There is not a Jewish Messiah and a Gentile Messiah. There is only Jesus whom God sent “to be the Savior of the world” (1 John 4:14). In the first century, this was a radical revelation. When John saw Jesus and said, “Behold, the Lamb of God who takes away the sin of the world!” it was an extraordinary thing. Jesus did not carry the Jews’ sins on the cross; he bore all our sins. (2) There are two kinds of people: those who believe and those who don’t. In the same letter, Paul talks about those who believe and receive eternal life (1 Tim 4:16). John said the same thing (1 John 5:13). So did Jesus on numerous occasions (John 3:15-16, 5:24, 6:40, 47, 11:25). Those who don’t believe don’t receive. If they perish, how can we consider them saved? Put them together and 1 Tim 4:10 says something this: Jesus is the Savior of the world, especially those who believe and are, in fact, saved. Thank you very much for clearing that up. I’ve been out of the the organized religion for 10 years and I believe God is getting the religious self performance out of my head and heart. Still waiting for a revelation that Christ Is in me.God took away the condemnation and cleanse my mind by his blood but other than that I’m still the same patched up good sinner.